The votes have been tallied and the results are in. We have a new set of officers for our local union at the UO. They’ve been elected for two-year terms and will be installed at our monthly union meeting on April 11. On behalf of your Elections Committee, I want to thank all those who offered themselves as candidates and everyone who voted in the election. Below are your new leaders. Your Stewards are: Candice Woyak, Chris Bogle, Chuck Theobald, Cimmeron Gillespie, Gary Malone, Jerimiah Igou, Johnny Earl, Lauradel Collins, Lisa Roberts, Lisa Wimberley, Lois Yoshishige, Michael Omogrosso, Mike Barr, Nikki Rudiger, Sara Clark, Stephanie Prentiss, Theodora Ko Thompson, Toni Campbell, Tony LaChapelle, and Morgan Blake. Your Bargaining Delegates are: Candice Woyak, Lisa Wimberley, Louie Vidmar, and Ruby F. Thompson. Your General Council Delegates are: Beth Singler, Cimmeron Gillespie, Gary Malone, Jason Stone, Jimmy Murray, Johnny Earl, Lisa Roberts, Louie Vidmar, Lynne Harrell, Michael Omogrosso, Sara Clark, and Jerimiah Igou. 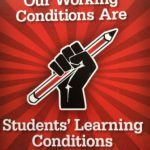 Your Strike/Hardship Committee members are: Craig Koharchick, Cynthia Lynn Hiers, Jerimiah Igou, Nicole Nelson, Rick Schwab, Toni Campbell, and Cimmeron Gillespie.